Amanda Knox convicted — of defamation? 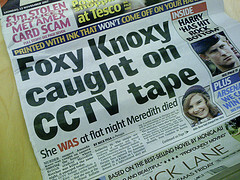 I must confess I haven’t been following the Amanda Knox saga closely. But something caught my eye in the story about her return to the States. She was convicted — not of murder, but of defamation — by an Italian jury. Some states in the U. S. may still have criminal libel laws on the books. But it’s safe to say no appellate court here would do what an Italian appellate court did — overturn her conviction for murder but uphold a criminal conviction for accusing the bar owner she worked for of committing the murder.